Fair-Trade Volunteer in Hawaii: Work Trade for Lodgings! Hedonisia was not just a place but, as we taught in the Hedonisia Handbook, it is also a prototype for intentional community living. Thought it is not possible to do jungle work in Hawaii for now, for those of you who like to work with their minds, it is still possible to be a volunteer and work on our EcoFeminist Web Portfolio. Volunteer in Hawaii for an Affordable Eco-Friendly Vacation! Ideal for those who wish to enjoy an affordable volunteer work experience while vacationing in Hawaii! We accept volunteers on a basis of availability, work skills, friendliness, ease to live with, performance and their understanding and enthusiasm for the sustainable policies of Hedonisia Hawaii. 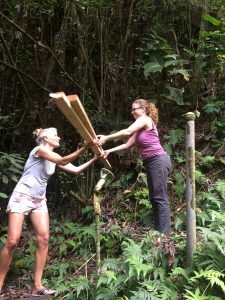 Volunteers have a great time, meet new friends and leave with satisfaction and enjoyment from living, learning and working in a Hawaiian Rainforest community. Community Living Educational Experience: At Hedonisia, we have developed policies and guidelines for sustainable communal living under our ‘Community of Individuals’ model. Tropical Food! Part of every volunteer’s payment is an Agricultural Fee. This allows you to harvest any edible plants growing on our land and gives you access to the communal food pantry, which is usually stocked with donated food items from departing guests. Please note that our food gardens are only a supplement to dietary needs (about 10-15%). Be sure to have enough funds as each person is responsible for their own meals. However, you can cook with other community members in our beautiful Jungle Kitchen! Full Access to all Communal Areas: Enjoy the Haka Hou Mana Mana outdoor kitchen. Relax and unwind in our jungle shower; get acquainted with our famous Eco-Toilet! Volunteers also have access to our outdoor, sheltered community hang-out area and our indoor barn space, which is equipped with a beautiful sprung dance floor called the Candy Barn Yoga Space! 12 hours Volunteer Work per Week of Stay. 4-day work week! Monday – Thursday. 3-hour shifts from 9:30-12:30pm. Afternoons free! Friday, Saturday & Sunday – No work! Every week has a long weekend! However, while most of the time we do jungle cleaning and jungle weeding. we do try to match volunteers with the work they wish to do especially if they are skilled! Hawaii State state tax INCLUDED in prices! a) 1st-Week Volunteer Tryout: For short stays of one week or less, the Tryout is ideal. And for those who want to ‘check us out’, it gives enough time to get to know the community and see if it’s a fit for you. It also gives us an opportunity to work with you and see how you fit into our ‘community of individuals’! b) 1st Day Off! When you arrive you have your first day off to get acclimatized to your new rainforest home in Hawaii. And then you start volunteering the day after! c) Fixed Departure Date: Volunteers who send in a good application and have a fixed departure date may book a stay for a fixed period of up to one month so that they are sure they have space. However, if you (or us) are not sure then we usually recommend just reserving the 1st Week Tryout and then we can take it from there after you arrive. d) Single Person 2-bed Dorm Lodgings. Single volunteers usually stay in one of the ‘dorm’ spaces; Ohi’a Camper, Rollinia House or Aloha Bus. Our shared dorms are not crowded. They have only two people of the same gender! If you have a tent you can also use one of our designated sheltered camping spots. This allows you to enjoy privacy without having to pay an Private Upgrade Fee! e) Single Person Private Spaces: Based on availability and upon request, single volunteers can pay an Upgrade fee for one of Jungle Cottage, Kahuna Cabin, Bamboo Bungalow, Ocean View or one of our other Eco-Huts! f) Couples lodging spaces. For volunteer couples, we have Guava Hut, Lono Hale, and Puka Hale which are private spaces that have full or queen beds. Ideal for volunteer couples in the rainforest! Jungle Cottage, Kahuna Cabin, Bamboo Bungalow and Ocean View are also available for an Upgrade Fee. g) Choosing a Space. Volunteers may stay in different lodging spaces during the course of their stay. We try not to move people around unnecessarily especially if they are happy and comfortable in a space. When a volunteer shows that they are hardworking and adaptable we are more open to extending certain privileges like choosing their space if it is available. h) Weekly & Monthly ‘Volunteer Lite’ Specials! Ideal for those who would also like as much tourist time as possible! Working only one Community Support Shift per week, you enjoy discounted lodgings for a longer stay! More Questions or Apply Now! Volunteer & Intern FAQ: Answers to even more questions about volunteering and living in Hawaii! Community Participant Application Form. Use this form if you have read enough and feel ready to apply! – Tech Volunteers in Hawaii Jungle!